Developer: IDEAL Computer Services, inc. IDEAL Calendar 4.7 is other software developed by IDEAL Computer Services, inc.. IDEAL Calendar is an intuitive calendar program for the individual user or multiple users. Add birthdays, anniversaries, schedule meetings, and more. Personalize the calendar with custom occasions, font, holidays, and background wallpaper. Print out the calendar in a month or day view. Generate HTML pages from the calendar entries. The flexible import and export options allow you to transfer calendar entries between the calendar and other programs or PDAs. Create your own plug-in or download existing plug-ins to extend the functionality. This program is shareware, which means you can download and use IDEAL Calendar 4.7 for free during 30-days trial period. After this period you gonna have to buy IDEAL Calendar 4.7 software for $20.00 or uninstall the program. 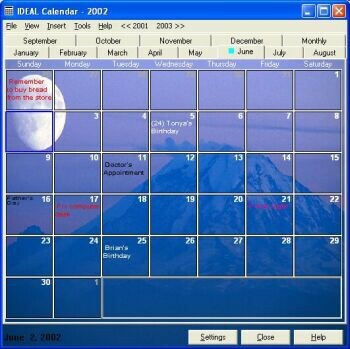 IDEAL Calendar 4.7 supports English interface languages and works with Windows 98/Vista. Latest IDEAL Calendar 4.7 does not contain any spyware and/or advertise modules, allowing installing it with no worries concerning valuable information loss. We has completely tested other software IDEAL Calendar 4.7 many times, written and published the interesting article and uploaded installation file (4102K) to our fast server. Downloading IDEAL Calendar 4.7 will take minute if you use fast ADSL connection. Do you forget about your anniversaries? Make your own calendar! CAF Calendar is a FileMaker calendar for scheduling your daily appointments by date, day and time.